Our Misguided Youth - Our Future? Almost 50% of millennials today believe that capitalism is bad and that ‘socialism’ is good. Whereas 80%+ of boomers believe the exact opposite. You might ask how this is possible. The answer is propaganda, not facts. Thanks to our public educational system, our kids are being brainwashed daily. To start, the word socialism is often used synonymously with the word communism. A large majority of this country cannot define, in even a rudimentary way, the differences between the two. 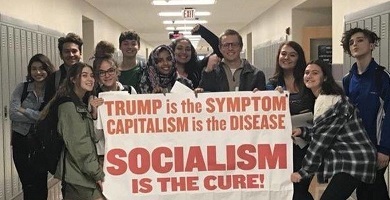 A simple definition using the two terms is: communism is a form of societal rule, using as a base a socialistic system of economics — redistribution of wealth. The problem is that communism has never, in any instance, shown itself to improve life for those under its control. The following video demonstrates its ineffectiveness through the use of numerous examples around the world. The real question is, how are we to get almost 50% of our young adults to understand they are on the wrong track heading for disaster? The answer is, you as the older more informed person needs to educate those who are within your circle of influence — starting with your own kids. If we don’t start pulling the collective heads out of the dark, we may be subject to this horrific future ourselves..? !